A group calling themselves "Yurtta Sulh Komitesi" (Peace at Home Council) in Turkish Armed Forces (coup plotters later to be discovered) declared a coup d'etat and stated that they have taken control of the country. Turkish soldiers under the command of the group blocked both bridges (Bosphorus and Fatih Sultan Mehmet) in Istanbul. The group took the control of the state television broadcast (TRT) and made anchor Tijen Karas read their manifesto. They declared curfew beginning 16th of July, 6 a.m.
Turkish citizens struck by the news of the coup d'etat formed queues in front of ATM's to withdraw money. Some protested the coup by forming convoys with their vehicles waving Turkish flags. Tanks were posted outside Istanbul’s Ataturk International Airport and in various locations of Istanbul and Ankara (capital of Turkey). Jets flied very low over Aksaray (Presidential Palace of Turkey) and other prominent places. Their flying very low created sonic booms which led the public into thinking multiple bombings occurring and made the public more terrorized and shocked. Access to social media (Twitter, Facebook and YouTube) were blocked, while the state-owned TRT television has gone off the air. About half an hour after midnight local time on Saturday, Erdoğan appeared on CNN Turk (via FaceTime), issuing a statement blaming Pennsylvania (implicating parallel state created in leadership of Fethullah Gülen) for the coup, calling for people to take the streets, and vowing "We will overcome this." "Some people illegally undertook an illegal action outside of the chain of command," Binali Yıldırım told in the broadcast of a private channel (NTV). "The government elected by the people remains in charge. This government will only go when the people say so." Who is behind the Turkish coup attempt? There are a few conspiracy theories about who is behind the attempted coup. The most noteworthy theory is that the mastermind of the coup attempt is US-based (Pennsylvania) Turkish cleric Fethullah Gulen. Fethullah Gülen is a political and religious figure. He is the head and the founder of Gülen Movement which his followers call "Hizmet" (means Service in Turkish). He emigrated to US in 1999, using his health problems as an excuse. He is located at Saylorsburg, Pennsylvania ever since. The Gülen movement has a long history, going back to the 1980s. One of the goals of the movement is to place his sympathizers and followers in the military and the Gülenists accomplished their aim to a large extent. Gülen's followers took up careers in the judiciary and the police forces as well. After the coup attempt, these careers are at stake. The government is spending a good amount of energy and time to ascertain these people's identities in terms of erasing all the traces of Gülen movement. Thousands were demoted already. The Gülen movement goes much beyond the charities, schools, and inter-faith activities with which it presents itself to the world. Its dark agenda surfaced very clearly as of the night of July 15th, 2016. Gülen movement followers also have engaged in covert activities such as blackmail, evidence fabrication, disinformation, wiretapping, and judicial manipulation by using their upper-hand in the judiciary system and media outlets. They convicted many innocent Kemalist, secular officers, generals in Ergenekon and Sledgehammer trials during 2008-2011, ruined lives. The ranks of the arrested generals and officers had been filled by officers involved in the July 15 coup attempt. The power struggle between Recep Tayyip Erdoğan and Fetullah Gülen became evident in late 2013 during the December 17-25 corruption investigation led by the Gülenist prosecutors (Zekeriya Öz was one of them and he also had took part in the Sledgehammer and Ergenekon trials). Erdoğan blamed Gülenist movement for forming a parallel structure against the state. Ever since AKP (the Justice and Development Party) has purged many Gülen movement sympathizers from the state institutions and shut down some of their media outlets. But none of the suspected the Gülen movement followers had been purged from the military. There are multiple evidences pointing to Gülen Movement for the coup attempt. The officers detaining Hulusi Akar (the chief of general staff) on the night of the coup attempt, offered Akar to put him in contact with Fethullah Gülen. Some other evidence pointing to Gülen is that Hulusi Akar's aide-de-camp who is known to be among the putschists was a closeted Gülenist. One other theory is that CIA has supported Gülen movement in the coup attempt. It is also known that Fethullah Gülen got his green card with the help of Graham Fuller who served in top positions at CIA. In conclusion the weight of the attempted coup is in the shoulders of Gülen although he denies his involvement with it. Ömer Halisdemir is one of the heroes of the attempted coup night. He shot putschist General Semih Terzi, the head of the group of soldiers attempting to take the control of the Special Forces Command. If the Special Forces Command had been seized, the coup plotters could have succeeded. Officer Ömer Halisdemir was martyred by the pro-coup soldiers right after he shot General Semih Terzi. On 20th of July after the cabinet council meeting, President Recep Tayyip Erdoğan made a statement that nationwide 3-month state of emergency was declared. 22:05 - Warplanes started flying low in Ankara (the capital of Turkey). One group of soldiers maintained one-way traffic on Bosphorus Bridge. People started to debate over whether it is a coup alarm or a terror attack on social media. 22:10 - Soldiers and the police started to confront in front of many public buildings across Turkey. Helicopters opened fire at MIT (National Intelligence Organization of Turkey) and the General Staff buildings in Ankara. 22:50 - News of the gunfire and explosion in some cities (particularly in Istanbul and Ankara) spread quickly on social media. 23:10 - Prime Minister Binali Yildirim called the incident as "attempt". He announced that a group within the Turkish army was behind the attempt and it was not supported by the Chief of Military Staff. All parties represented in the parliament condemned the coup attempt. 23:25 - Access to social media (Twitter, Facebook and YouTube) was blocked, while the state-owned TRT television has gone off the air. Periscope and Whatsapp, however, were reportedly running normally. Soon after the block on Youtube, Facebook and Twitter was removed. 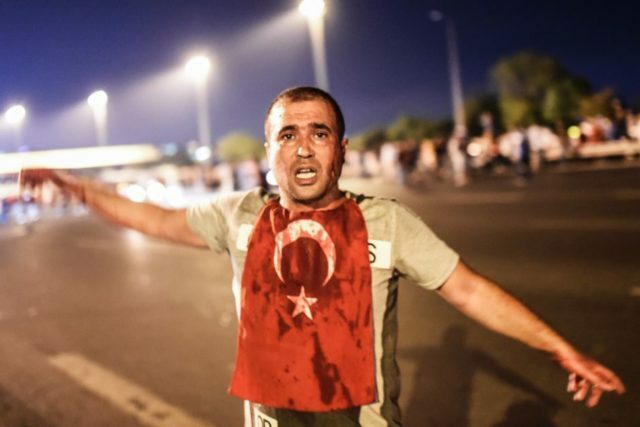 23:45 - Group engaged in the coup attempt sent a message saying “The military has taken control” from the email account which Turkish Armed forces uses to communicate with accredited journalists. 00:15 - Soldiers in the coup attempt detained TRT news anchor Tijen Karaş and made her read a statement at gunpoint in Ankara studios of TRT. Minister of Defence Fikri Işık has noted that the declaration is a pirate statement. 00:35 - Spokesperson for the National Security Council, Ned Price tweeted that US President Barack Obama has been apprised of the unfolding situation in Turkey. 00:37 - President Recep Tayyip Erdogan, asked Turkish citizens to take the streets to support the government. Erdogan told CNN Turk on FaceTime that the coup attempt was an uprising of a small group in Turkish Armed Forces. 01:10 - Sikorsky type military helicopter shot TurkSAT (state satellite operator) headquarters at Gölbasi, Ankara. 01:30 - With the aim of gathering people to stand out against the coup plotters, sela prayers were recited all over Turkey and people were called to take the streets. Sela prayers are generally recited from mosques before funerals, however they are sometimes performed to rally individuals behind a common cause. 01:40 - Some soldiers opened fire at protesters trying to cross the Bosphorus Bridge. 02:21 – The F-16 that bombed Police Special Operations Forces headquarters at Golbasi (47 policemen killed) was shot down. 02:50 - F-16's and military helicopters began to strike TBMM (the Turkish Parliament). Four bombs were thrown near the gates of the parliament until morning. MP's and journalists hid in a shelter in the parliament building. 03: 23 - A group of soldiers with their helicopters raided several television stations and media centers such as CNN Turk, Dogan Media Center (Owner of Hürriyet) and interrupted the broadcast. Employees are forced out of the buildings. 04:07 - President Erdoğan made a speech at the Istanbul Ataturk Airport to the crows waiting to meet him: "There is no power over the nation." 04:37 - President Erdoğan: "This is a revolt and betrayal. People responsible for this will pay a very heavy price for their act of high treason." 05:02 - Presidential statement: "The danger has not passed yet. As long as our people is on the streets and care for their country, these subversive traitors won't be able to bring our nation to their knees. Let's not leave the streets. Let's claim our will and leader." 05:10 – The soldiers who raided Dogan Media Center were taken into custody by the police. hurriyet.com.tr CNN Turk, Kanal D and DHA employees began to return to the building. 06:00 – The President Recep Tayyip Erdoğan's adviser Mustafa Varank's brother Ilhan Varank, publicist of Adalet ve Kalkınma Partisi Erol Olçak and his 16 year old son Abdullah Tayyip Olçak are among more than 160 citizens who lost their lives so far. 06:26 - Smoke is coming from the presidential complex, it is reported that the planes bombed the region. 06:42 – The soldiers on the Bosphorus Bridge in Istanbul surrendered. Some of the soldiers were attempted to be lynched by the public. 07:48 - Ministry of Internal Affairs: "29 colonels, 5 generals were suspended from duty. 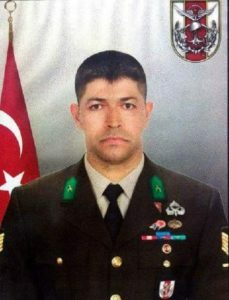 Air Pilot Colonel Erhan Baltacıoğlu was detained." 08:16 – Bosphorus Bridge closed by the tanks during the night was partially opened to traffic after the surrender of the soldiers. 08:46 – Twenty-three tank operators and thirteen navy soldiers were detained. Two admirals kidnapped by the soldiers attempted coup were saved with a police operation. 08:55 - Chief of Staff General Hulusi Akar and General Secretary of the President Fahri Kasırga were rescued from pro-coup soldiers. 09:47 – The Ministry of Justice announced the arrest of 563 Turkish armed forces personnel. 09:56 – Fatih Sultan Mehmet bridge was opened to traffic. 10:07 – 700 unarmed soldiers from the General Staff surrendered to the police. 11:01 – The Deputy Chief of Staff General Ümit Dündar said: “The coup attempt was rejected by the chain of command since the very start. Our people protected our democracy and republic by going on the streets and fighting against the coup supporters. Our president, prime minister, ministers and members of the parliament acted in “full solidarity” with the Turkish Armed Forces (TSK)." 2016 Turkish coup d'état attempt (15th of July, 2016) shook Turkey to its core, and the fight against FETO (Fethullahist Terrorist Organization) continues in full swing.